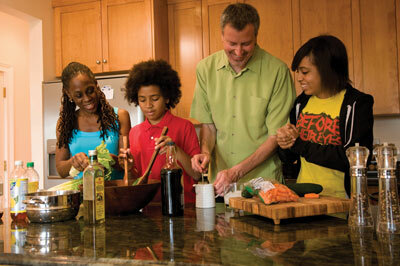 Chirlane McCary today (far left) with husband Bill de Blasio and children Dante and Chiara. And, I don’t want everyone looking at me. and wouldn’t have to make sense if I did. Her participation in the Homegirls anthology was not Chirlane McCray’s first or most courageous effort on the part of advancing Black women’s interests and issues. A member of the groundbreaking Combahee River Collective, she was also one of the first (if not the first) African American woman to write openly about lesbianism in a mainstream periodical. Her highly controversial article, “I Am a Lesbian,” appeared in Essence Magazine in 1979, where it sparked an intergroup dialogue around gender and sexuality in Black communities. Today Chirlane McCray is a marketing executive for Brooklyn’s Maimonides Medical Center, but she is still challenging mainstream values and sensibilities, in even broader and more visible arenas. She features prominently in a recent series of campaign ads created in support of her husband, New York City political candidate Bill de Blasio. De Blasio is running for New York City Public Advocate, and the recent advertisements featuring the candidate with his wife and children are the first political ads in anyone’s memory to openly feature and Black-white mixed race couple. In liberal New York these ads may well have been more of a boon than a distraction, but an article on Ben Smith’s Politico blog notes that even as recently as 2007, only 77% of Americans “approved” of interracial relationships. In 1994, that number was less than 50%. While de Blasio won the Democratic primary (via runoff) in New York, there is a significant likelihood that his campaign strategy (featuring his wife and children freely throughout his campaign) would have dissuaded more candidates that it attracted, had he run in a more conservative region of the country. But dDe Blasio isn’t running in a more conservative region. He is running in New York; and he has a strong chance of getting elected to this post, which is only a couple of political steps away from becoming the mayor. I say, “Run Bill, Run.” And let this office be only the first step in a career that will take you all the way to Gracie mansion. How thrilling it would be for the greatest city in the world to have the first radical Black feminist as its first lady woman. If evolution biology and latest DNA-genetic studies were carefully taught in schools people might understand how really ridiculous whole “race” issue is. And why? Because DNA studies of genetic lines of people are telling that same story: all people all over the world are descents of one and only African woman who once lived in Africa about 150 000 years ago. All Europeans, just like all Asians and Native Americans are actually from same mitochondrial mtDNA genetic line of L3. We can call her (L3) “African Eve”. This isn’t even scientific issue. The idea of race as ideology (based on skin color) was founded just over 300 years ago. It’s pretty short period of life of modern humans. It took even several decades to make so called whites to believe in this theory. Not long time ago i mentioned to my son that he or at least his children will see a time when this whole racial pyramid has been tumbled down.